Welcome to the most important lesson you will learn in crochet. It is the hardest lesson to teach, but the easiest to learn. Really… all you have to do is read and pay attention. There really is no work involved, but the information in those blogs are helpful when you’re trying to create things. Gauge is best learned with experience. You may read this now and it may make no sense whatsoever to you. However, do read it because it may make the difference for you int the future. It’s one of those things that just “clicks” all the sudden and you’re like OOOOOHHHH!!! So – bookmark this page so that you can come back in a few months when you start really being able to utilize gauge. If you are a seasoned crocheter, don’t skip this! These blogs give even advanced crocheters and ladies who have crocheted for 30 years light bulbs! Gauge is literally the MOST important part about crocheting. 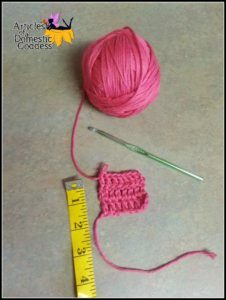 If you do not have a firm grasp on gauge and how it works, then the items you create from looking at patterns may be like the items in the pictures sometimes, when you get lucky and happen to crochet exactly like the designer, and other times sizing can differ GREATLY. It is not because the design is bad. If you are not checking gauge then you cannot complete a pattern to specifications. I check gauge when following my own patterns even and on every pattern I come across. With items like amigurumi, the gauge does not matter too terribly much, however, you want safety eyes and things to be proportionate like the original. However, the technique that you use to create your stitches does matter greatly and this can alter the way that the item looks and sometimes impede your ability to make amigurumi items at all. The technique also relates directly with gauge on items with sizing, especially where stitch height is concerned and can alter items that have sizing as a factor. This technique will help you with amigurumi and also will translate over into all other parts of crochet — Make sure you read about being a lifter, rider or yanker. With amigurumi, your stitches have to be very tight, but not tight in the sense that your tension has to suffer or your hands ache. The blog below will help with that. use gauge to make it work in other sizes. This site will help you choose a good alternative. Also, this blog from Planet June will help you to select a yarn that is ACTUALLY comparable to the yarns used in the patterns you will be creating. All worsted weight yarns are NOT created equally! Congratulations! At this point, if you’ve been following along with classes and/or just flipping through these lessons, then you know everything that you need to know to crochet and follow a pattern, although every day you will probably learn something new. I hope that you have enjoyed this compilation of walk-throughs on learning to crochet. Please comment below if there is anything I forgot to include that a beginner might need to know and I’ll add it. If there are other video walk-throughs that you enjoy that you would like to see added to this list, I would be happy to add them as well. I would like to have as many options as possible available to beginners so that they can find what works for them. I am happy to help any beginner that is in need of direction, support or help in any way, feel free to message me on Facebook and I will help in any way that I can. No question is a bad one. I’m here if you need me! Let’s move on and make something cool! Finished? Move on to Lesson 7 – Putting it all together – Pattern Reading – Let’s Make Something Cool!